Mossin' Annie over at Mountain Moss discusses the whimsical nature of terraria - who hasn't imagined their terrarium as a miniature landscape? Mountain Moss is a treasure trove for moss enthusiasts (who grow moss indoors and out) and I always enjoy their newsletters. 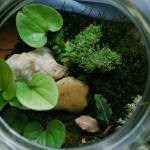 i've got some very nice moss from them -- highly recommended! I'm glad to hear that Shireen! Did you order a large quantity of moss for an outdoor project?